Feeling the need to creatively express yourself in a public space? 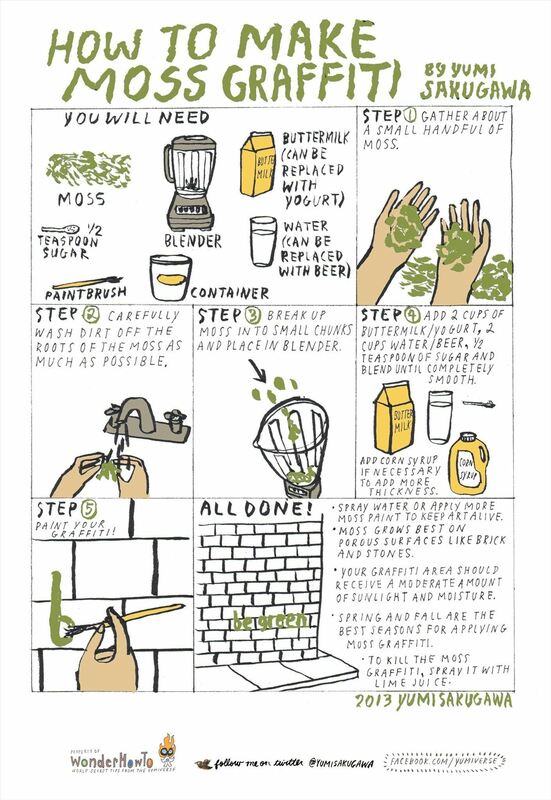 Make an artistic statement with some DIY moss graffiti using moss, buttermilk, beer, a paintbrush, and some imagination. Simply gather your ingredients, blend until desired consistency is reached, and paint your graffiti onto a porous surface (such as a brick or stone wall) where there is moderate sunlight, sufficient moisture, and ideally in the spring or fall season when the weather isn't too dry, too cold, or too hot. To maintain your moss graffiti over time, spray with water on a regular basis or apply a new layer of moss paint. To kill the graffiti or to remove parts of it, spray with lime juice. Interested in other ways to make public street art? Check out this guide on making a street art wheat paste poster. News: A New Ink & Paint! News: Banksy sponsors free street art at the Geffen Contemporary on Mondays! News: Find Out Who Is Already On It! News: Unknown, but They Shouldn't Be. News: The bombing science website. How To: Be The Next Banksy (or just a clever street artist). I unfortunately don't think it can work with lichen since they are completely different things (a lichen is composed of a symbiotic relationship between a fungus and a photosynthetic partner, a moss is a plant). Though, if anyone has ever succeeded with making lichen graffiti I would love to hear it!